Can Blackberry Make A Comeback? Despite releasing a decent Blackberry smartphone as well as a tablet that is out selling everyone save iPad 2, investors do not seem to be pleased with RIM overall. Chalk one up to RIM, whose Blackberry Playbook is apparently outselling all their rivals save for the Â iPad 2 (who dominates the tablet market). Despite being half the size of Motorola’s Xoom as well as requiring a Blackberry device in order to access basic features like a calendar (note: seriously RIM? ),Â the Playbook seems to be a hit amongst the masses. Motorola also reported 250,000 units sold, although they only mentioned how many tablets were sold to stores and not directly to consumers (which is a way of saying a product is a dud). Although RIM’s quarter million sales to consumers are not blockbuster figures, it does give them something to boast about when addressing their critics (this author included). If RIM is able to perform this well underneath Apple’s shadow with a mini-tablet, how much better could they do with a full sized tablet with all of the bells and whistles? Food for thought. Hulu apparently is continuing their “iOS only” campaign, as the company has reportedly blocked Blackberry Playbook lovers from viewing videos over the web. The block came within 48 hours of Playbook’s release which means fans of the device now have no way of watching Hulu as the company has yet to make an app for Playbook (or even Blackberry smartphones for that matter). Currently there is no workaround for Playbook fans (at least not yet), although hopefully Hulu considers releasing an official app in the future (at least for Hulu Plus fans). After showcasing their Blackberry Torch, it looks like the smartphone giant has decided against calling their tablet “blackpad” (which was a stupid name truthfully) and has instead embraced Playbook. Yes, seriously. The tablet thus far seems eerily familiar to the iPad, although unlike Steve Jobs greatest creation the Playbook can view flash websites which should make up for RIM’s anemic app store. It also boasts a 3 MP front facing camera (note: iPad 2.0 will probably receive this as well), as well as a 5 MP rear camera which should help give the Playbook someÂ distinctionÂ in the tablet wars. Unlike the iPad however, I’m seeing no mention of a built in 3G service, although they do say you will need a Blackberry smartphone if you want to surf the net outside of WiFi. 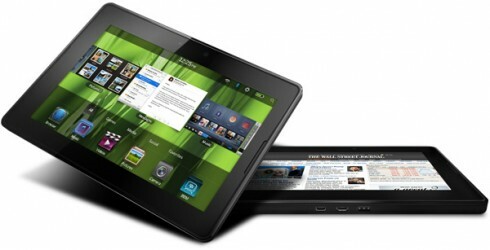 Either way it’s smart that RIM is debuting the Playbook now before the world goes ga-ga over the iPad this holiday season. Note: Unfortunately for HP, Playbook’s debut makes it all the harder for them to make a webOS comeback with PalmPad (although their HP Slate should keep the company relevant through 2011).